Welcome to Chao Dental Studio! Dr. Patricia Chao is excited to welcome you to her premier family dental practice in Santa Clara, California. This practice has served this community for 30 years, and Dr. Chao feels humbled to continue a tradition of tending to her patients’ oral health and building strong interpersonal relationships with her neighbors. Chao Dental Studio takes a personal approach to providing care that exceeds expectations, catering to patients who value personal attention and proficient dentistry. Dr. Chao knows that establishing a strong doctor-patient relationship requires time, trust, and communication. She enjoys spending her time educating each patient on their current oral conditions, allowing patients to take an active role in their health and make informed decisions. Dr. Chao is an experienced dentist who provides high-quality general dentistry to families and patients of all ages in a relaxing, friendly, and personalized setting. By specializing in preventative, restorative, and cosmetic procedures, Dr. Chao and her team strive to create healthy, functional, and beautiful patient smiles for a lifetime. 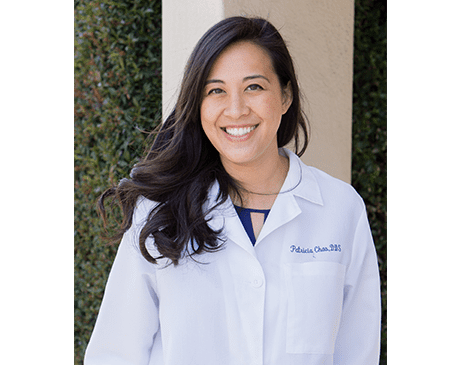 Dr. Chao was born and raised in Houston, where she graduated from The University of Texas School of Dentistry with a Doctor of Dental Surgery degree. Having worked in a chilly Chicago for a few years, she headed to the Golden State with her family and planted her roots under the sunshine of Santa Clara. She is a member of the American Dental Association and California Dental Association, and is an active participant in the Santa Clara County Dental Society. She proudly calls this Santa Clara community her home, and enjoys spending her time raising her three beautiful, young children with her husband Jeffrey. Please contact the office for additional insurance inquiries.